Pores are the small dots or tiny openings visible in the surface area of your skin. Pores helps to keep your skin moisturized and supple by providing it with oil, which is present in a gland that is found at the bottom of the pore. The gland is called sebaceous gland or the oil gland. Open or enlarged pores are one of the most common beauty problems, especially in people with oily skin. They are unsightly and can make you look dull and aged. Tighter and smaller pores reflect light better, making the skin look younger and healthier. Oily skin people have overactive oil glands which causes excessive oil secretion. 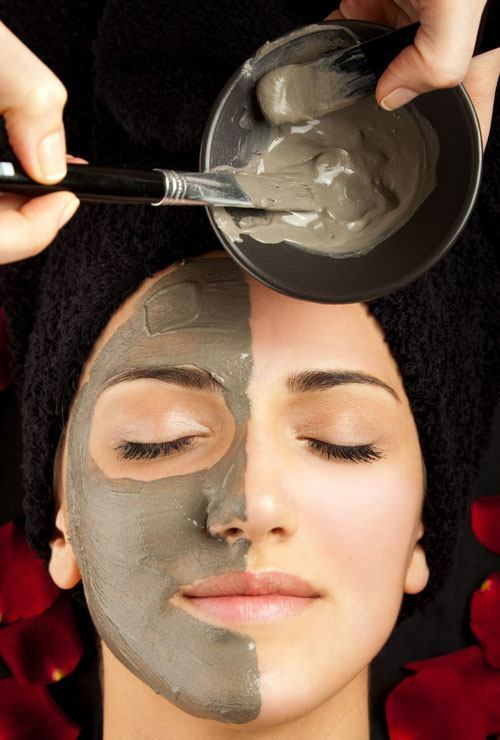 Excessive oil along with dirt and impurities clogs your pores, resulting in inflammation. The inflammation causes the walls of the pore to stretch. With the constant stretching, the pores lose their elasticity and the opening becomes larger and visible. Other than that, prolonged sun exposure and aging also damage the collagen in the skin, reducing the elasticity of your skin leading to large open pores. Poor skin care routine, genetics and stress also play a major role in contributing to open pores. If left untreated, open pores worsen and can lead to blemishes and breakout that can further lead to blackheads, acne and whiteheads. 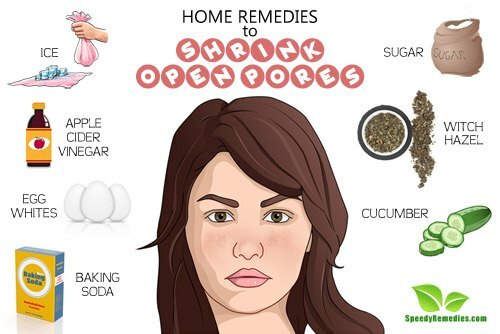 Although there is no permanent solution for open pores, a number of home remedies can help minimize and shrink your pores making them less eye-catching. Here are few natural remedies to help you combat the problem of open pores. Before trying any of these beauty tricks, always make sure to wash your hands and face thoroughly. Ice has a skin-tightening effect, which helps in shrinking enlarged pores. It also stimulates blood circulation. Running ice over your open pores can reduce the size and appearance of your pores. It is often used for minimizing enlarged pores before applying makeup. Take few ice cubes and wrap it in a washcloth. Wait a minute for the cubes to start melting. Glide it over your face in circular motion for 30 seconds. Do this several times daily. Alternatively, mix lemon juice and water in equal proportion and freeze the liquid in an ice tray. Once the ice forms; take out the ice cubes in a washcloth and rub it over your face for 30 seconds. Take 1 tablespoon of apple cider vinegar and egg white of one egg. Blend it together well. Put the mixture in your ice tray and let it freeze. Take out the ice cubes and rub it over your face for few seconds. Let it dry for 15 minutes and wash off. Pat dry. Even washing your face with ice cold water once daily can help in minimizing the size of open pores. You can even put lemon juice, rose water, green tea or tomato juice in your ice tray and use the frozen ice cubes on your face to shrink your pores. Apple Cider Vinegar acts as a natural astringent and helps in skin toning. It tightens the skin and reduces the size of open pores. Apple cider vinegar’s antimicrobial and antibacterial properties help your skin to get rid of bacteria and other contaminants. Take ½ cup of water; add 1/3 cup of apple cider vinegar, add few drops of any essential oil, add few drops of lemon. Mix the solution well and put it in a spritz bottle. Spray it all over your face. Wash it off after 3-4 minutes. Take equal proportions of apple cider vinegar and water. Apply this solution on your face with cotton ball. Leave it for 3-4 minutes. Wash it off and pat dry. Do this regularly. The proteins in egg whites are said to contract your skin. They also help in removing dead skin cells and stimulate the production of new skin cells in their place, thereby reducing the size of open pores. Egg whites are widely used on skin for their skin-tightening effects and their ability to soak up excessive oil from skin. Take an egg white and whisk it. Spread it evenly on your face. Once dry, rinse it off. Do this once a week. Take two eggs and separate the whites in a bowl. Add a few drops of lemon juice to the whites and mix them together to form a paste. Apply the paste on your face and leave it to dry for 10 minutes. Wash it off with lukewarm water. Follow this up with cold water and pat dry. The mild acidity in baking soda removes excess oil, dirt and debris from your skin. Due to its antibacterial and anti-inflammatory properties, it reduces acne and pimples. Baking soda helps to maintain the pH levels of your skin. Take 2 tablespoons of baking soda and add 2 tablespoons of lukewarm water. Mix the ingredients thoroughly. If the mixture is too thick or watery, adjust the amount of water and baking soda accordingly. Massage the mixture in a circular motion for few seconds. Avoid the eye area. Leave it for 10 minutes. Rinse it off using cold water. Moisturize your skin in case of dryness. Do this twice a week. Use a half cup of baking soda, a tablespoon of apple cider vinegar, and a teaspoon of lemon juice to form a paste. Apply the mixture in circular motion on your face. Leave it for 10 minutes. Remove it by using a cotton ball dipped in lukewarm water. Rinse your face with cold water. Moisturize if needed. Do this twice a week. Lemon juice contains citric acid that acts as an astringent and helps minimize the appearance of open pores. Lemon juice helps to tighten your skin making it look firm and youthful. Take one tablespoon of lemon juice; add one cup of rose water and half cup of cucumber juice to it. Mix it well. Apply the liquid all over your face and leave it for 10 minutes. Wash it off with cold water. Do this regularly. Take equal amounts of lemon juice and rose water in a bowl. Mix it well. Apply it all over your face. Wash it off with cold water after 10 minutes. Apply a mixture of one tablespoon of lemon juice and tomato juice each. Apply it over your face and leave it for 15 minutes. Wash it off with cold water. Do this 4-5 times a week. Fuller’s earth is a great remedy for open pores as it absorbs excess oil and tightens the pores. It also helps in cleansing your skin. Take 1 tablespoon of fuller’s earth and few drops of rose water. Mix it together well to make a paste. Apply a thin layer all over your face. Avoid lips and the area around your eyes. Allow it to dry. As fuller’s earth can leave your skin dry, refrain from leaving it for a long time. Mix 2 tablespoons of fuller’s earth with 1 tablespoon of honey and 1 tablespoon of milk. Mix it well and apply it over your face. Allow it to dry for 15 minutes. Wash it off with cold water. Take 4 tablespoons of fuller’s earth; add 1 teaspoon honey, 2 tablespoons of fresh lemon juice, 1 egg white. Mix all the ingredients together. Apply the paste on your face. The paste should be thick enough so as to not drip from your face. Wash it off when the paste dries off. Witch hazel works as a natural astringent as it contains tannins that help remove excess oil, tighten the skin and reduce the size of pores. Its strong antioxidant and astringent properties help fight bacteria and reduces inflammation. Use a non-alcoholic witch hazel as alcohol will dry up your skin. After cleansing your face, saturate a cotton ball with few drops of witch hazel and thoroughly wipe your face with it. Do this regularly. Take 2 tablespoon of rose water and add 1 tablespoon of non-alcoholic witch hazel. Pour the ingredients in a spray bottle and shake gently. Spray it on a cotton ball and rub it on your face or close your eyes and spray it on your face. Let it dry. Follow it up with a moisturizing lotion if needed. Do this regularly. Sugar scrub can be effective in reducing large pores as it helps in exfoliating and remove excess oil, dead skin and impurities. Take 1 tablespoons of sugar; add 1 tablespoon of baking soda and 2 tablespoons of water. Stir it together to form a thick paste and massage it into your damp skin. Leave it for 2 minutes. Rinse well with warm water. Pat the skin dry. For acne-prone skin, take 1 tablespoon of honey and 1 tablespoon of water instead of two tablespoons of water. Mix 2 tablespoons of sugar, 1 tablespoon of olive oil and few drops of lemon juice. Gently rub it on your skin for 30 seconds. Wash it off with cold water. Do this twice a week. Put a little sugar on a slice of lemon and gently rub it all over your face. Allow it to dry for 10 minutes. Wash it off. Do this twice a week. Yogurt helps tighten the skin. The lactic acid in yogurt helps to reduce the size of open pores. Take some fresh yogurt. Apply it on your skin and leave it for 10 minutes. First wash it with warm water and then with cold water. Pat dry. Take 1 tablespoon of gram flour, a pinch of turmeric and two tablespoons of plain yogurt. Apply this paste on your face and leave it for 15 minutes. Wash it off with cold water. Do this twice a week. Mix 2 tablespoon of yogurt and 1 tablespoon of honey. Apply the mixture evenly on your face. Leave it for 5 minutes. Wash it with warm water, followed by cold water. Tomatoes work as natural astringent that helps tighten your skin and shrink large pores. Take 1 tablespoon of tomato juice. Mix in a few drops of fresh lemon juice. Apply the mixture on your cleansed face with a cotton ball. Let it sit for 10 minutes. Rinse it off with cold water. Do this twice a week. Take 1 tablespoon of tomato juice. Add little honey to the mixture. Apply it to your face in circular motion. Leave it for 10 minutes. Wash it off with warm water. Then rinse your face with cold water. 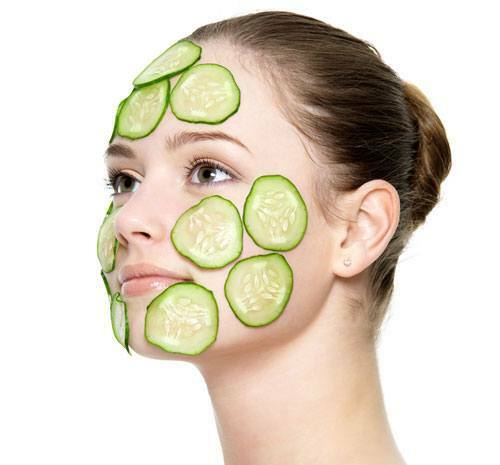 Cucumber is a natural astringent that helps to minimize open pores. It also improves your skin tone, imparting a natural shine to your skin. Peel 1/2 a cucumber and blend it until smooth. Add 1 tablespoon of lemon juice and blend again. Take 2 tablespoons of the mixture and rub it on your face. Let it sit for 5 minutes. Rinse it off with cold water. Take the rest of the mixture and store it in a container in the fridge. Use it over the next few days. Grate ½ a cucumber and extract its juice. Soak a cotton ball in it and apply it all over face. Leave it for 20 minutes and rinse it off with cold water. You can even add few drop of lemon juice to the cucumber juice. The astringent properties of buttermilk help tighten open pores. Regular application of buttermilk helps minimize the size of open pores. Take half a cup of buttermilk. Add a pinch of salt in it and mix well so that the salt gets dissolved in the buttermilk. Dab a clean cotton ball in the mixture. Apply the solution all over your face. Leave it for 20 minutes and rinse it off with warm water. Follow this up by cold water. For additional benefits, you can even add tomato juice in the buttermilk beforehand. You can follow some of these steps to prevent the occurrence of open pores. Follow a good skin care regime. Never go to bed without cleaning your face. Avoid using harsh soaps, scrubs and chemicals on your skin as it can aggravate enlargement of pores. Don’t squeeze your pimples. When you try to pop your pimples, you will end up enlarging your pores. Always wear sunscreen. It will protect your skin from UV rays that results in collagen degradation. Always remove your make-up before getting to bed. Make-up can clog your pores. Limit the use of make-up on large pores. Avoid fried and processed foods. They can cause inflammation and clogged pores. Opt for a rich diet consisting of nuts, vegetables and fruits. Use skin-care products according to your skin type. Using heavy creams and lotions will clog your pores and can enlarge them.